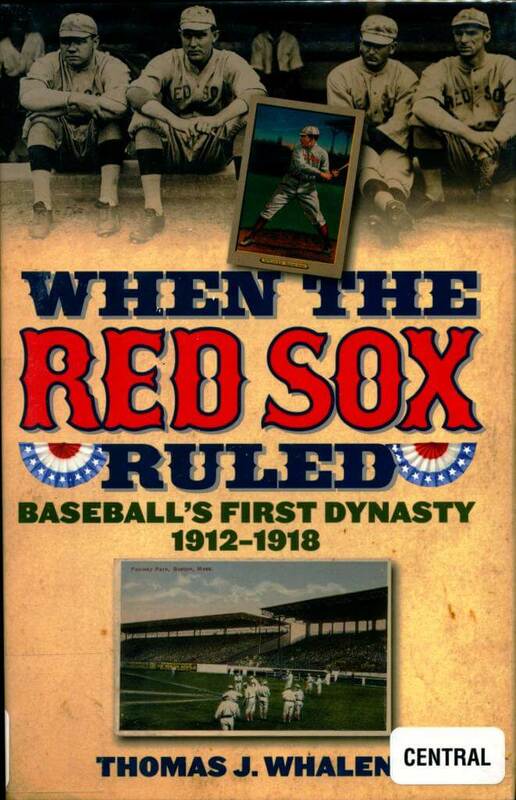 from When the Red Sox Ruled: Baseball’s First Dynasty 1912 – 1918 (2011) by Thomas J. Whalen. 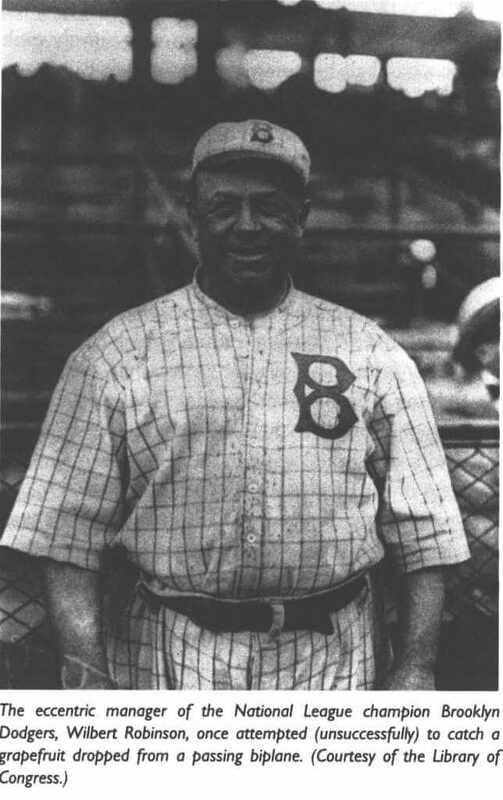 Although the Dodgers became the Dodgers around 1910 (after dropping Trolley from the “Trolley Dodgers”), in 1916 they were called the Robins, named after their colorful manager Wilbert Robinson. 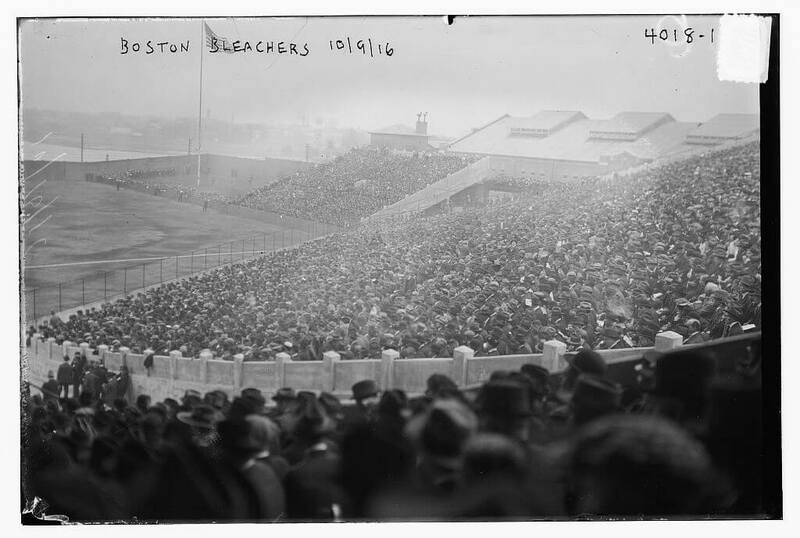 The games in Boston were not played at Fenway Park but in the home park of the National League Boston Braves (now Nickerson Field) which had a larger capacity and hence more ticket sales. Tonight, the current Red Sox begin a quest for their fourth championship in 15 years. 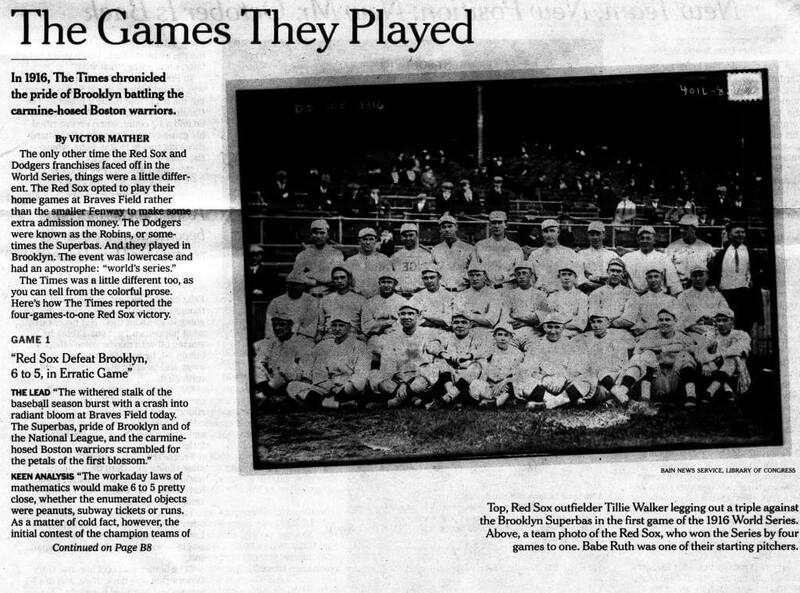 As Thomas W. Whalen reminds us in When the Red Sox Ruled: Baseball’s First Dynasty (2011), the modern Sox are unlikely to match their forbearers who dominated the so-called Dead Ball Era. 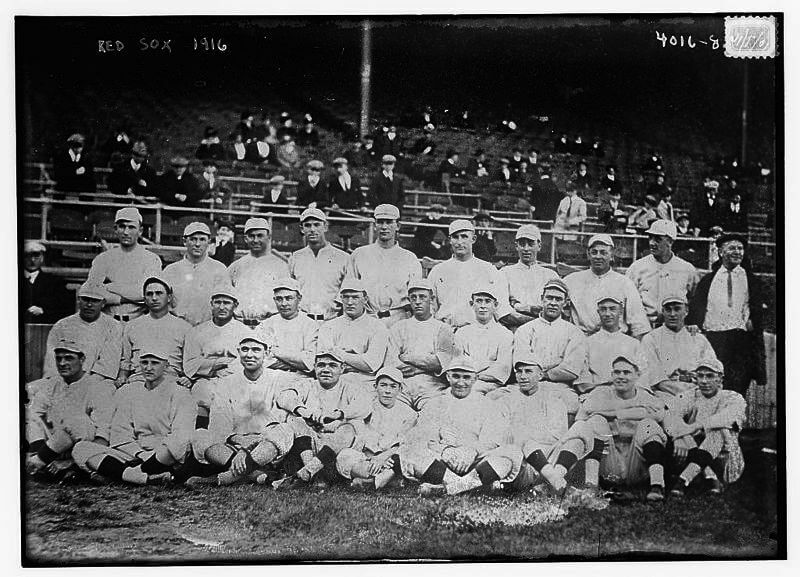 The Sox (then called the Americans) also won the first World Series in 1903. 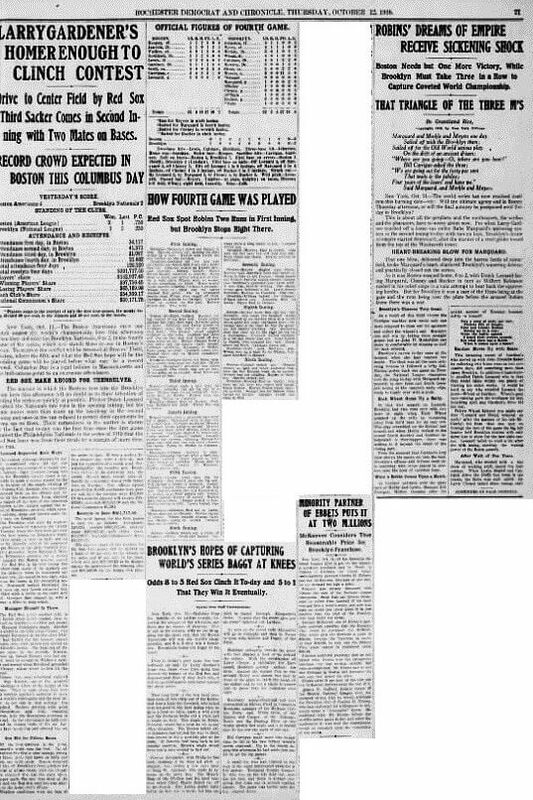 Led by centerfielder Tris Speaker and pitcher Smokey Joe Wood, the Red Sox beat the Giants in 1912 and the Phillies in 1915. 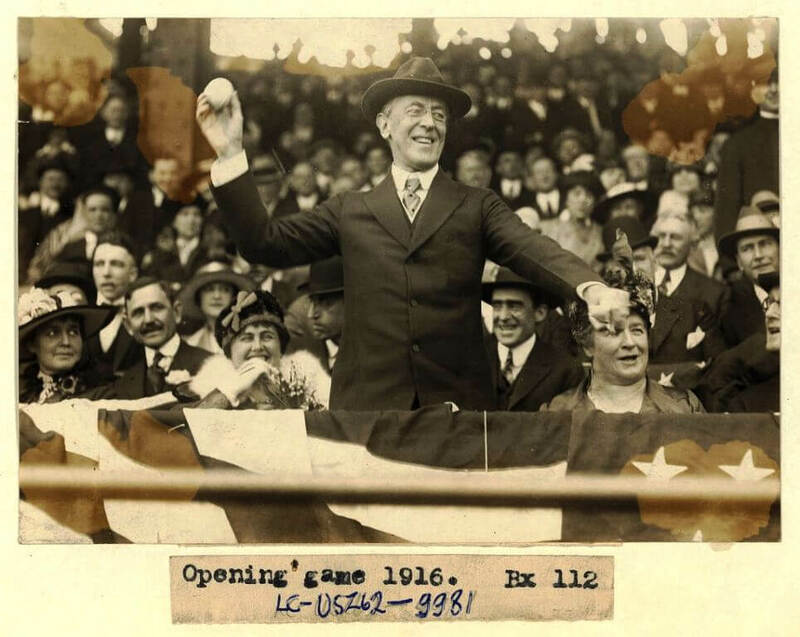 In 1916, Speaker was traded and Wood retired (later he would return to the game as an outfielder). 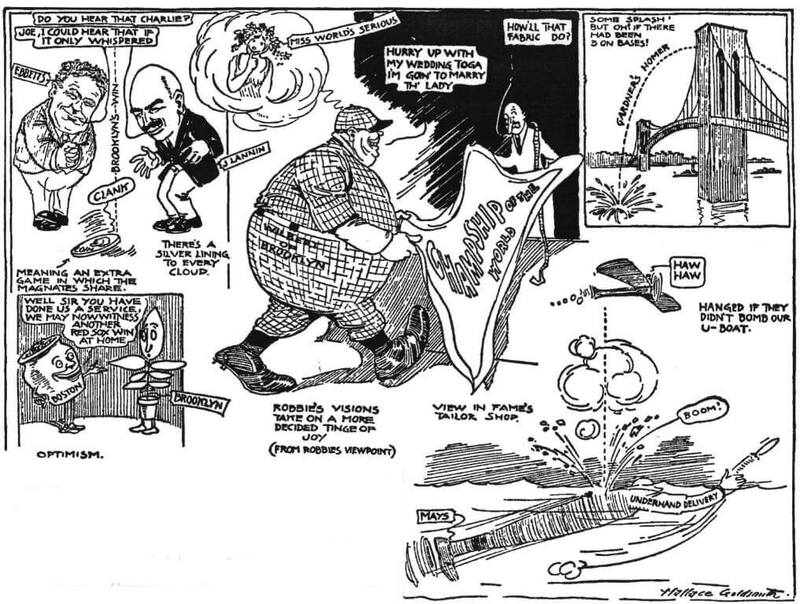 Luckily, for the Red Sox, the phenom George Herman “Babe” Ruth came to the rescue. 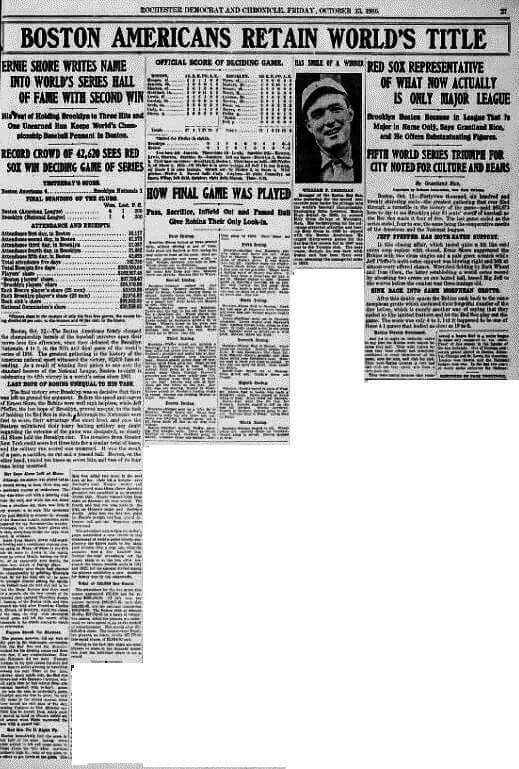 Ruth first joined Boston in 1914 at age 19 as a raw but preternaturally gifted pitcher. 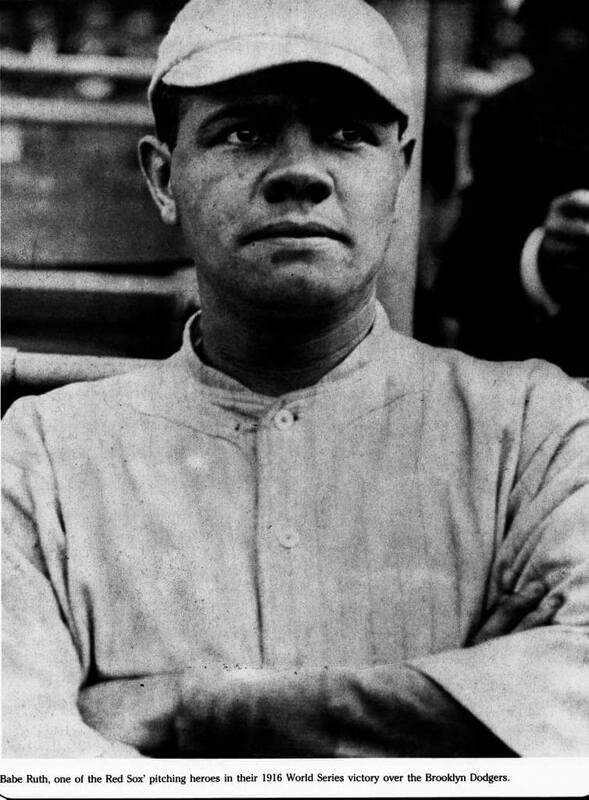 After an 18 win season in 1915 (although he did not pitch in the series and only pinch hit once), in 1916 the Babe had perhaps his best season, winning 23 games with a 1.75 ERA. 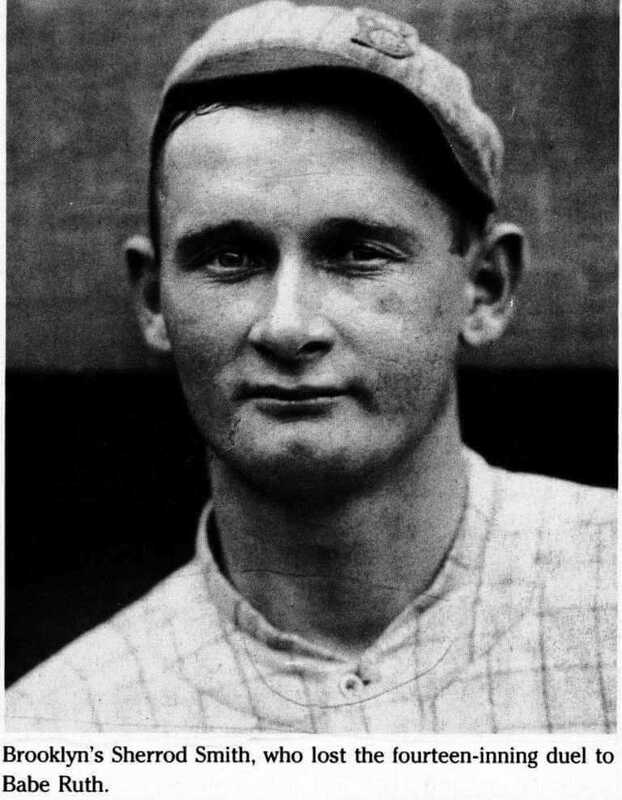 Nonetheless, Ruth’s lifestyle did not prevent him from pitching 13 straight scoreless innings in game 2 of the 1916 World Series, winning 22 games with a 2.01 ERA in 1917, winning two more games in the 1918 World Series and hitting 654 home runs for the Yankees (along with a Curse that lasted 84 years). 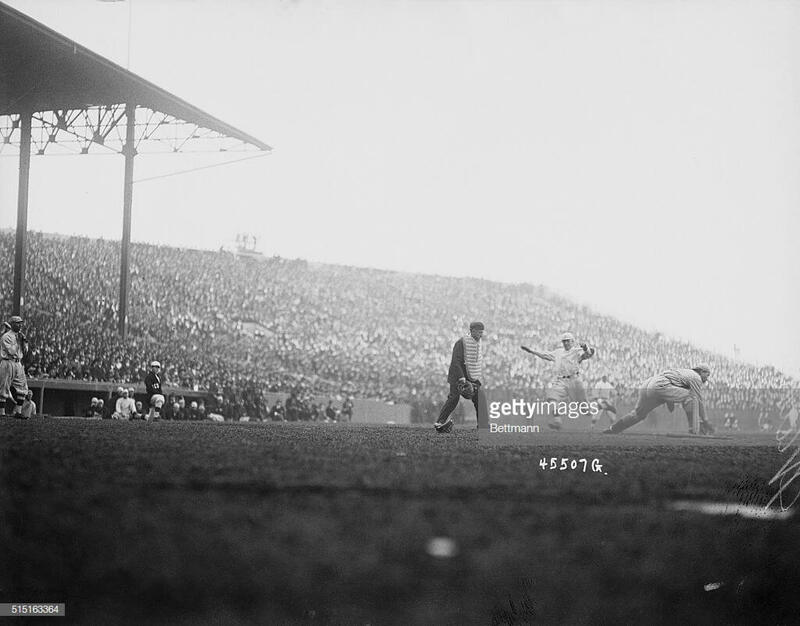 Nonetheless, the reserved crowd witnessed the most exciting game of the Series. The Red Sox jumped to a 6-1 lead. In the fourth the Robin’s bats came alive. 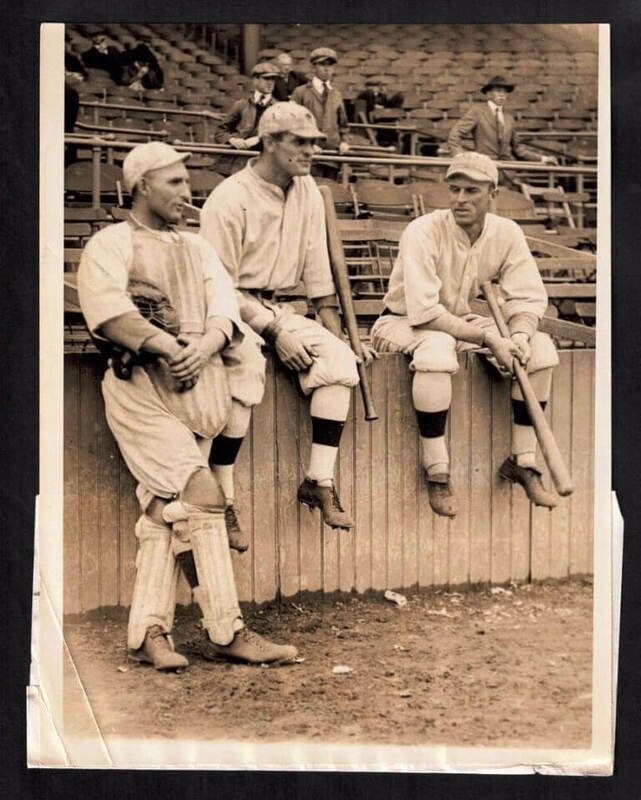 Zack Wheat tripled home Casey Stengel with one out. 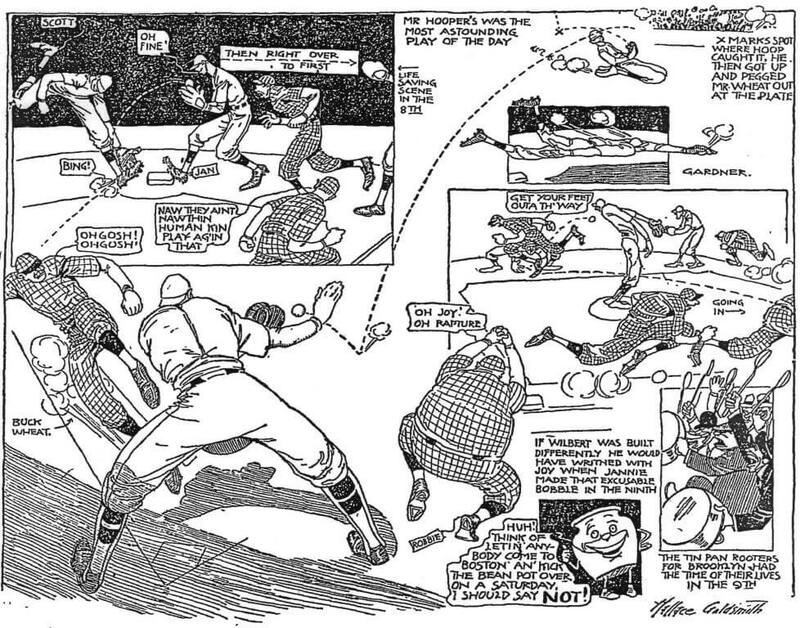 The Robin’s might have scored more in the frame had Harry Hooper not made a spectacular double play off a hard-hit ball to right field by George Cutshaw, the Brooklyn second baseman, one that amazed the Boston Post‘s Paul Shannon. 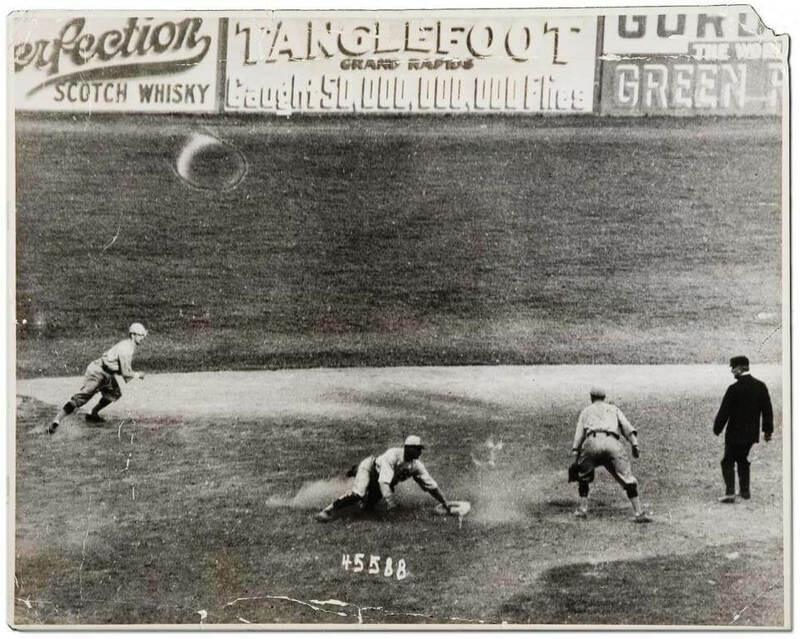 The game featured a dramatic rally by Brooklyn in the ninth, one that left the hitherto subdued crowd — and readers of the New York Times — gasping. The Robins loaded the bases and closed the score to 6 -4. Carrigan went to his bullpen. Mays gave up an RBI to Hy Myers to bring the Robins within a one run with the bases still loaded. But Mays induced Jake Daubert to ground out. 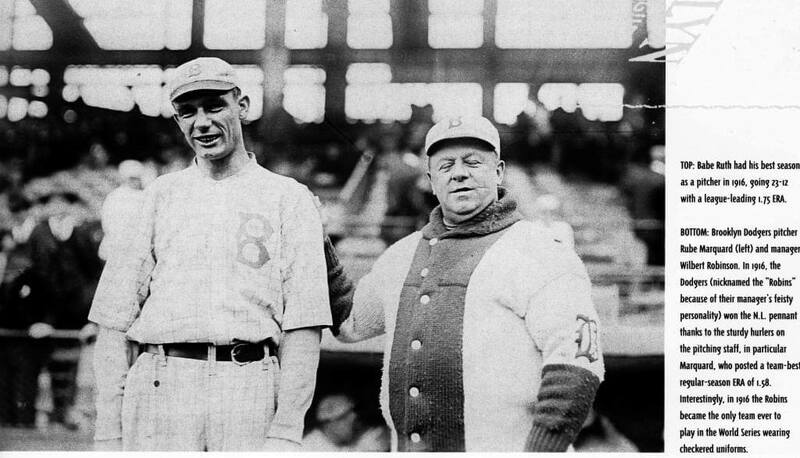 During that era, starters usually pitched complete games unless they were battered early or were pinch hit for. May’s last inning save was a rarity. 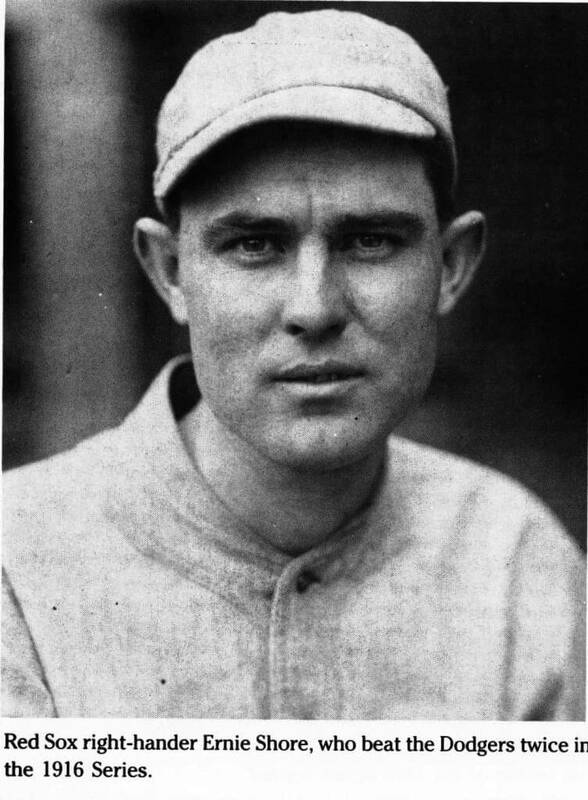 The Series actually featured two saves for the first time as Brooklyn’s Jeff Pfeiffer closed out Game 3 with 2 2/3 perfect innings. 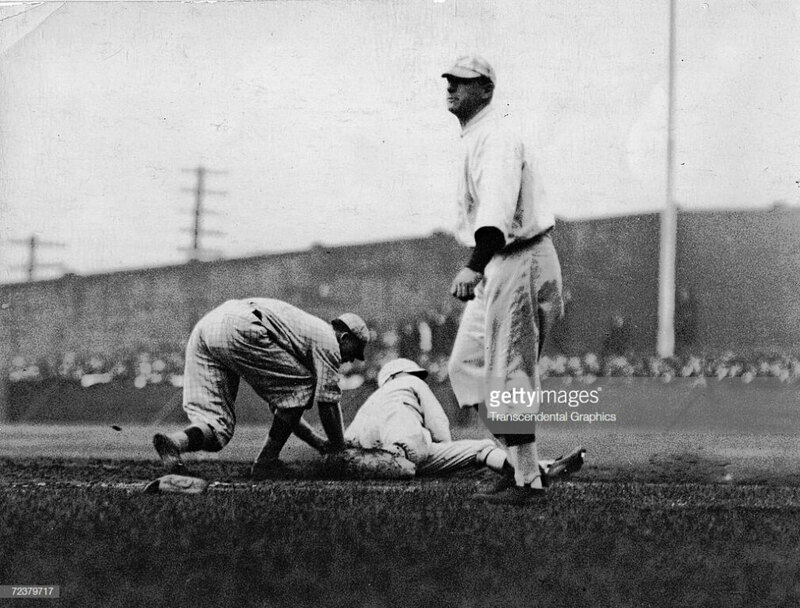 In fact, prior to 1916, there had only been one save recorded in the World Series in total, when Doc White of the White Sox registered a three-inning save against the Cubs in Game 5 of the 1906 World Series. 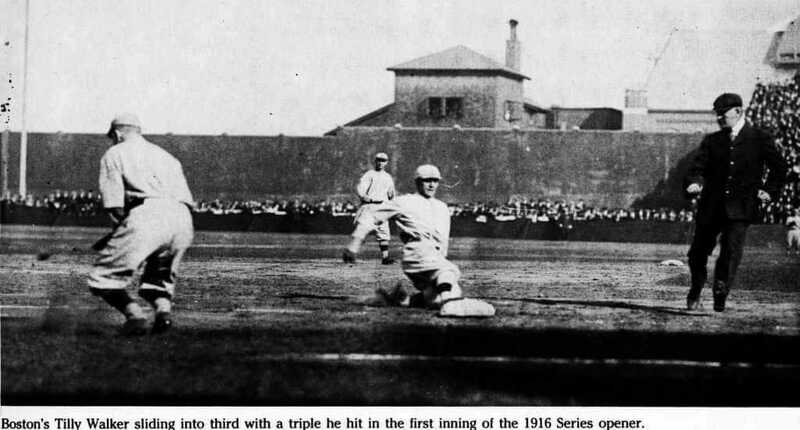 Not until 1924 did a World Series again see two saves. 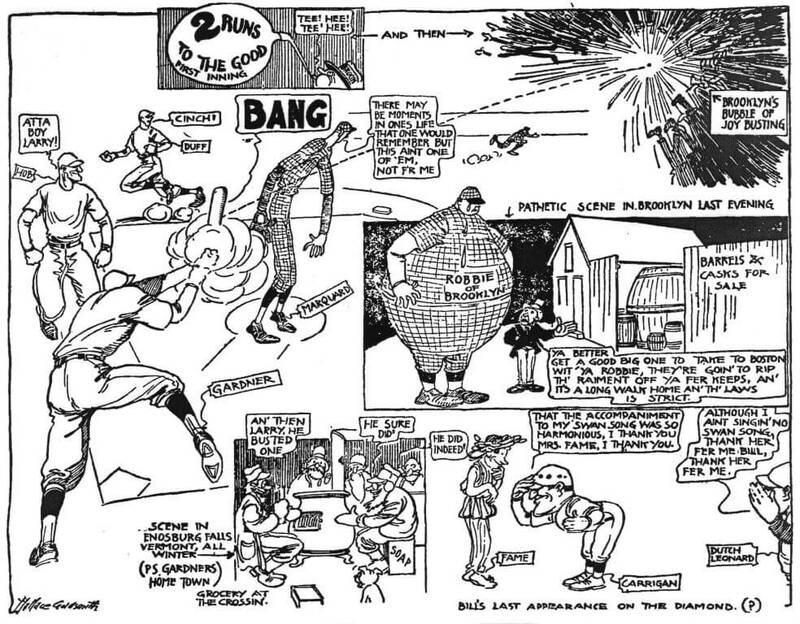 In another stark contrast between that era and ours, Boston only used five pitchers. 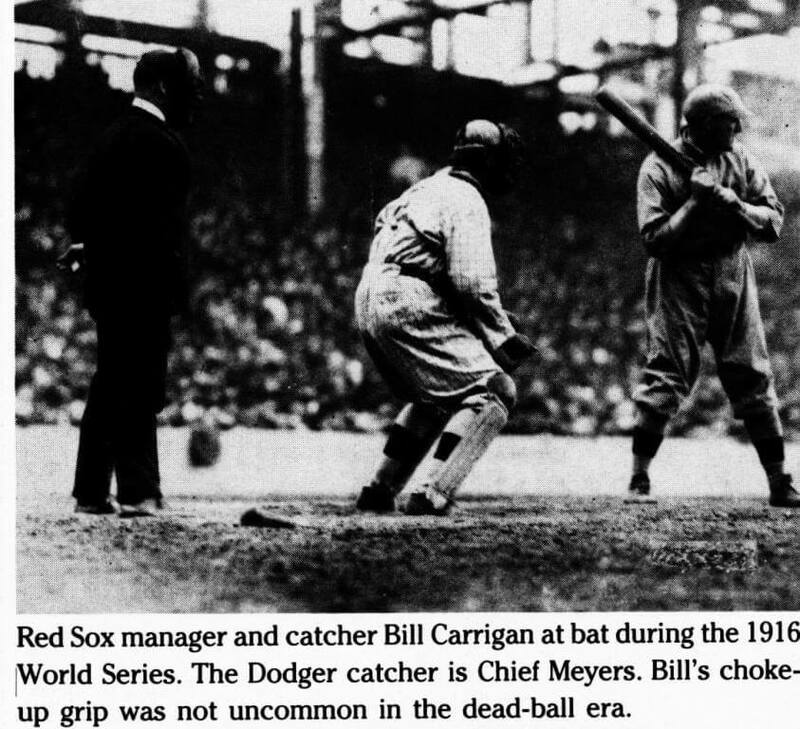 Although, five is two more than the three pitchers the Red Sox used a year before in the 1915 World Series. By contrast, in the 2018 World Series, the Red Sox are carrying 11 pitchers and the Dodgers 12. Red Sox, in Boston for first game. 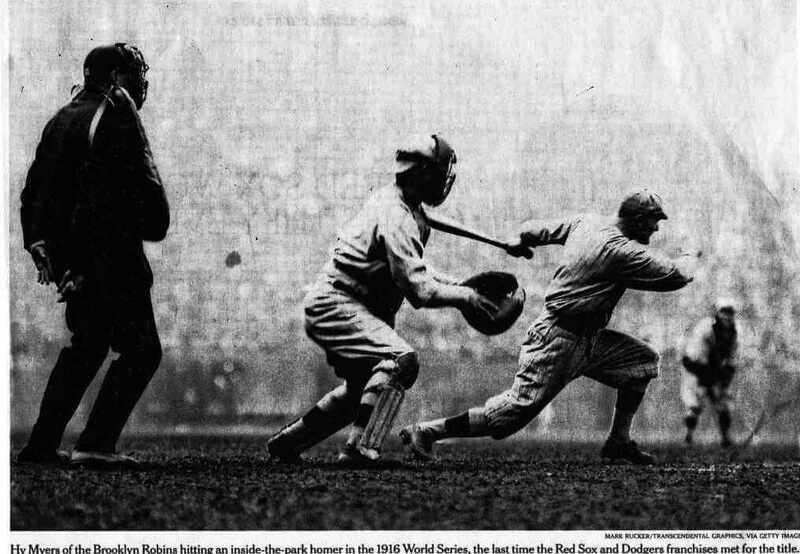 Photo shows Hooper, first man at bat for Boston. 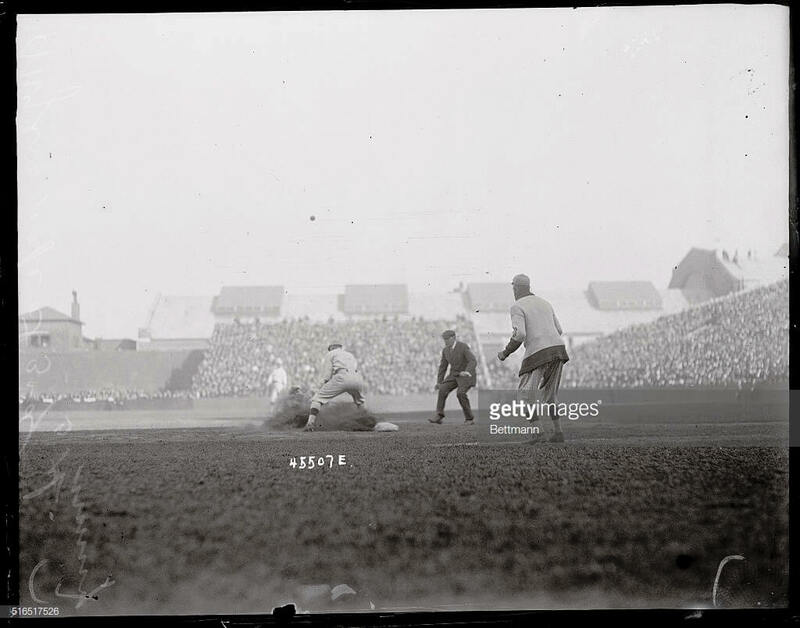 Tilly Walker of the Boston Red Sox scores a run for his team in the seventh inning of game one. As another sign of different times, the 13 plus innings only took 2 hours and 32 minutes. 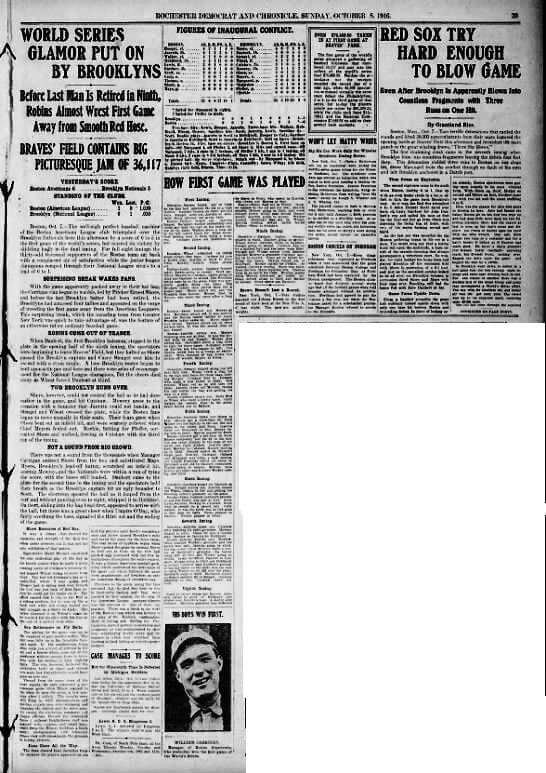 Looking at the play-by-play, we see that batters in the Dead Ball era did not take a lot of pitches, but put the ball in play quickly. In the combined 17 1/3 innings pitched by Smith and Ruth, the pitchers combined for a total of only 15 walks and strikeouts. 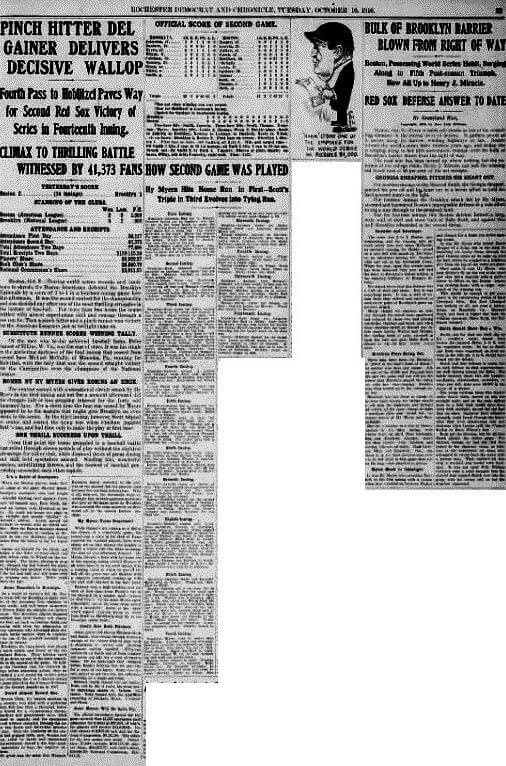 Despite the fervor, attendance at the game was low, only 21,087. 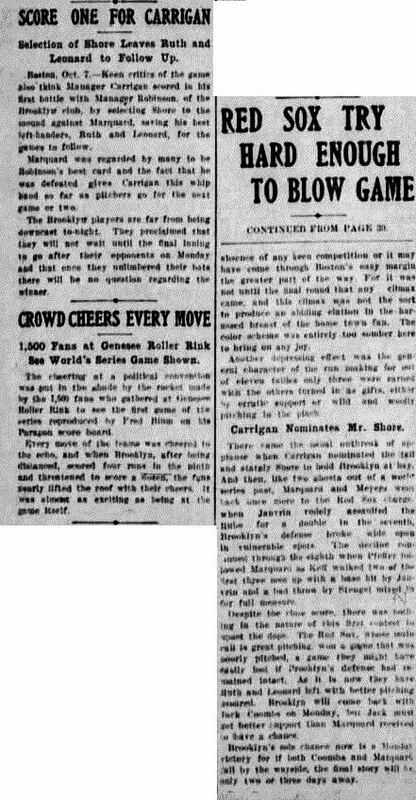 The Democrat and Chronicle’s staff correspondent opined that the empty seats were a result of the “extortionistic” ticket price of $5 the Robins were charging. 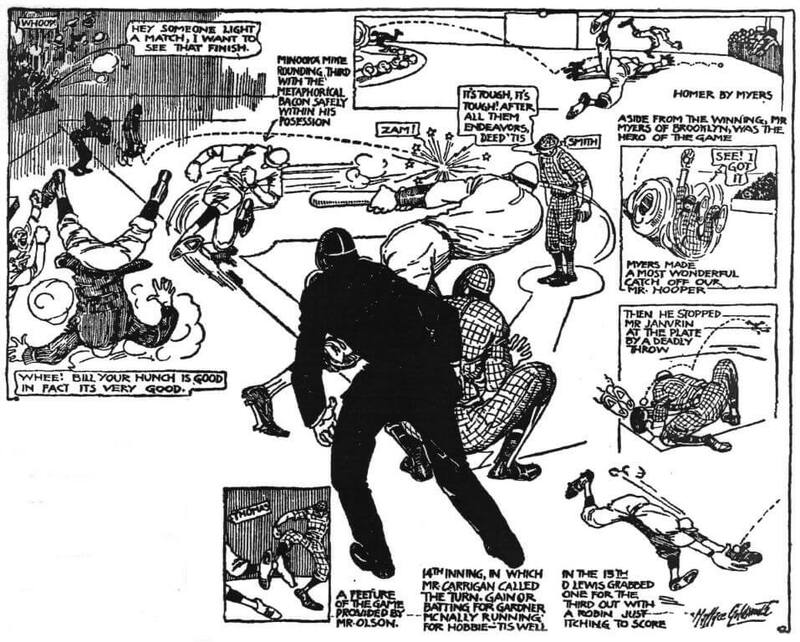 The D & C also ran a a piece on how Rochestarians were following the series. 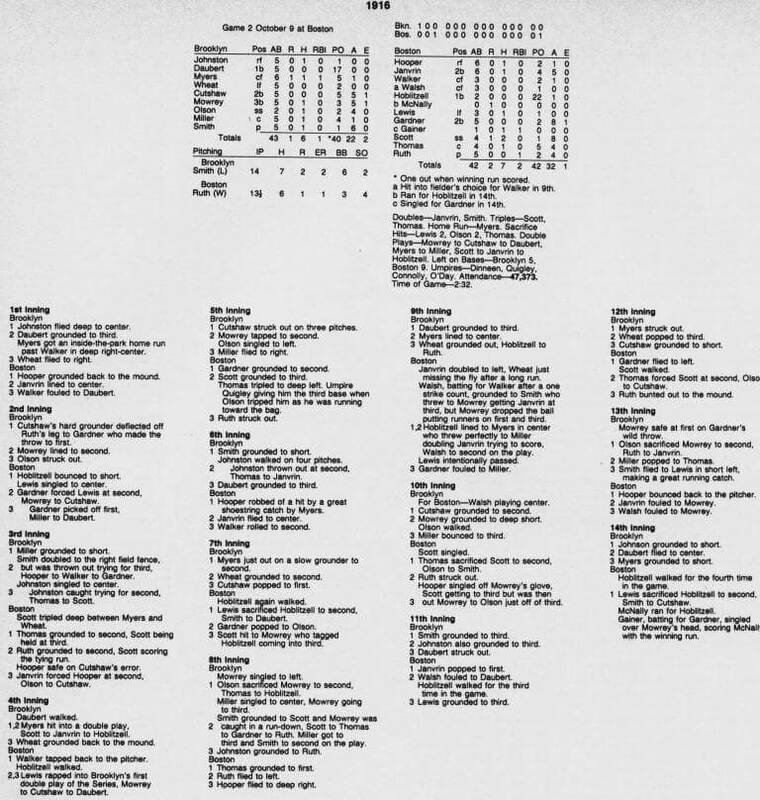 In those days, fans gathered to follow the game on electronic or Paragon boards that received telegraphic information and replicated a stadium scoreboard. The Geeusee Arna had a Paragon board, while the Baker Theater had an electronic board. After three straight one run games, the Red Sox took control of the Series with a 6 – 2 win. 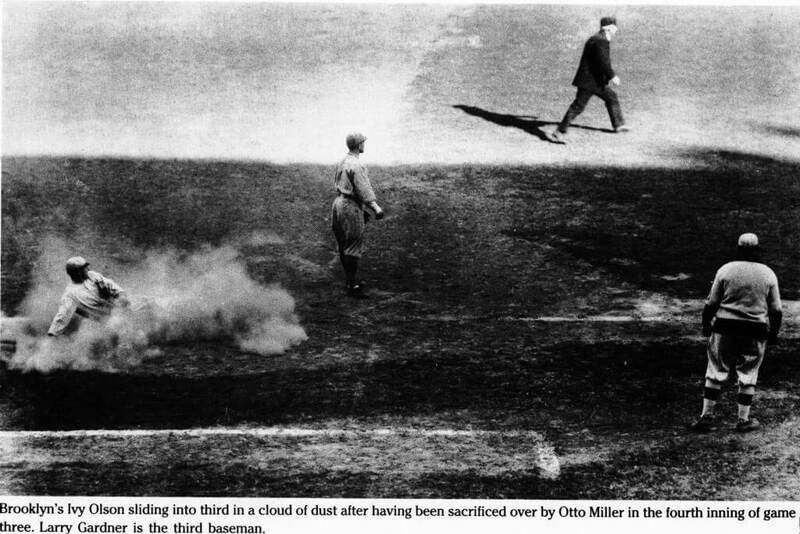 -10/12/1916-New York, NY: Ebbets Field. 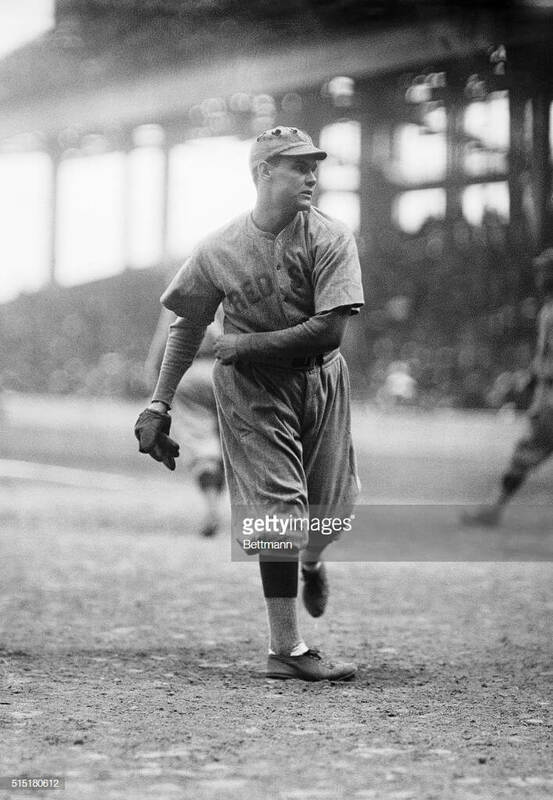 Red Sox pitcher Dutch Leonard warms up before fourth game of the World Series. 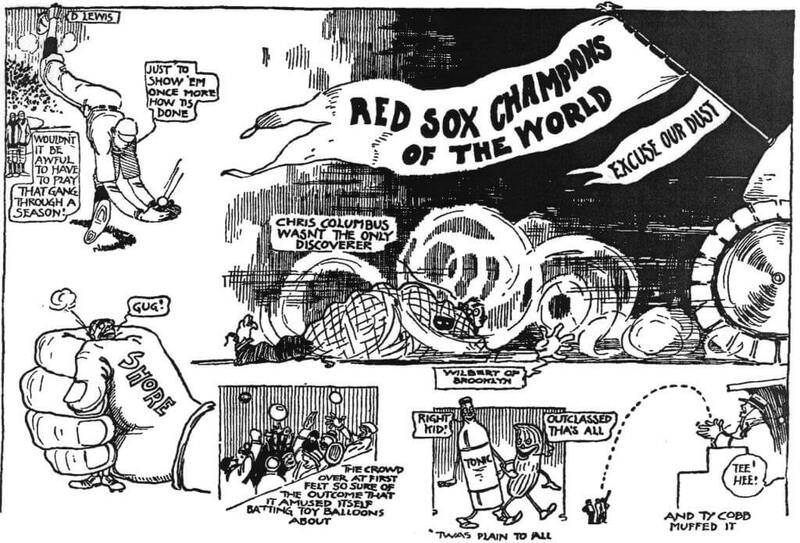 This year’s Red Sox hope history repeats itself. 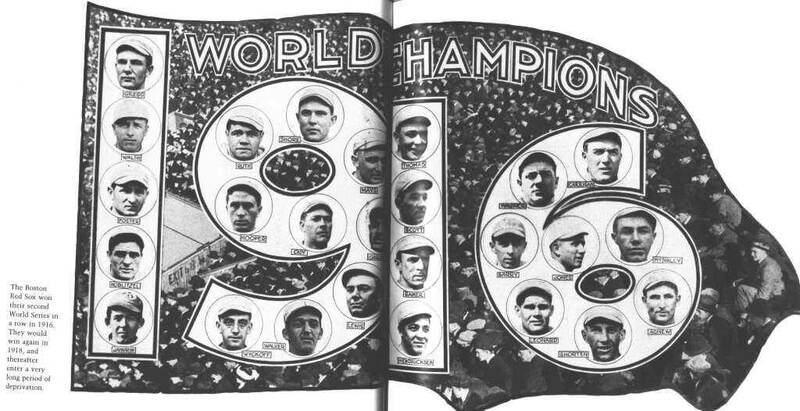 As they were in 1916, the 2018 Red Sox are favored. 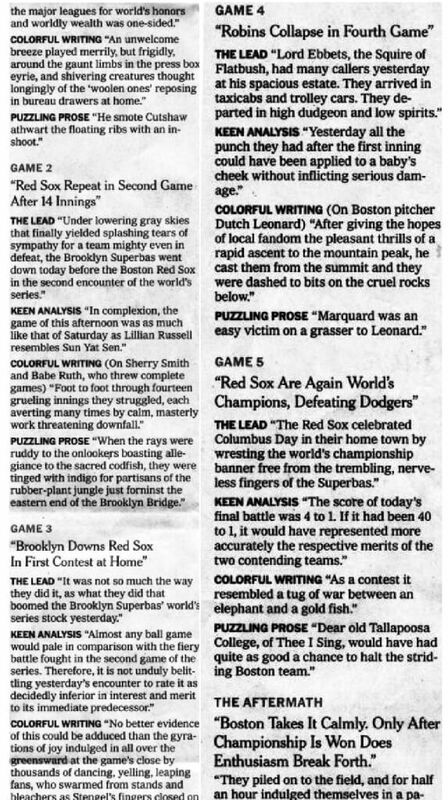 Seven USA Today sportswriter prognosticated: 4 predicted Boston in 6; 3 predicted Boston in 5. The Red Sox better hope the Dodgers don’t have one more “wild autumnal flurry” in them. 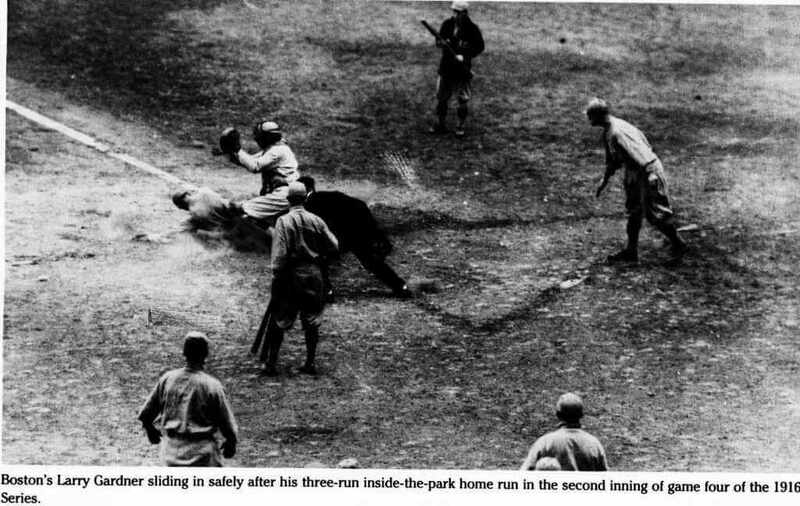 George Cutshaw of the Brooklyn Dodgers is shown safe at third in second inning of Game Five of this Brooklyn Robins versus Boston Red Sox game. 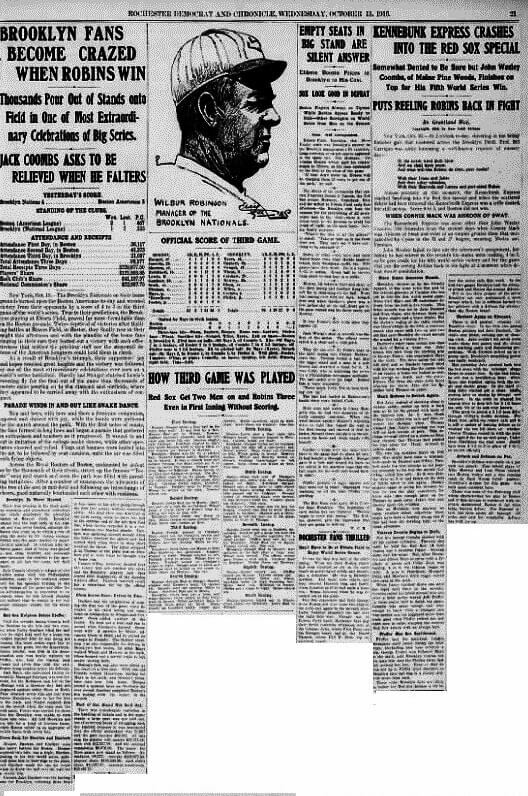 NOTE: For more on the purple prose used by sportswriters to describe the 1916 World Series, see How The New York Times Covered the 1916 World Series (10/24/18).